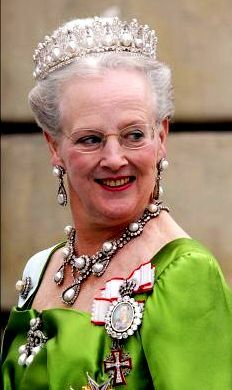 Many of you held this one up as a better example of a whopper tiara than the Luxembourg Empire Tiara; now you can see it came quite close. We've covered this one before, click above to revisit. This would have been my pick for a non-typical tiara over the Cut Steel Tiara. 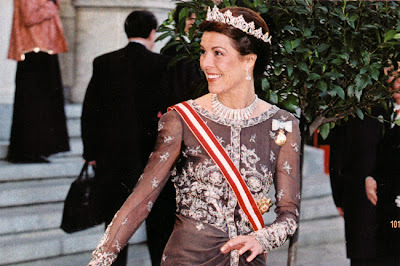 It has a tremendous history and is the family's wedding tiara. We haven't covered this on its own yet. Some of you were wondering where the rest of Sweden's collection was after we did your Top 15 - after all, only two made the list and they have a very sizeable stash. Well, here you go: 16, 17, 18, and another one below too. We haven't discussed this particular one in depth yet. 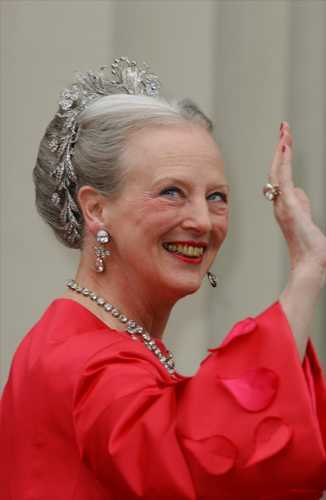 A classic pearl tiara, and a lovely one at that. This has been in our spotlight before, click above for that entry. 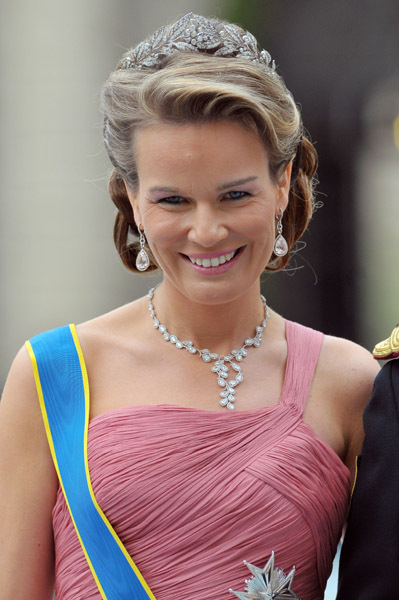 Mette-Marit's signature tiara, a delicate floral piece. 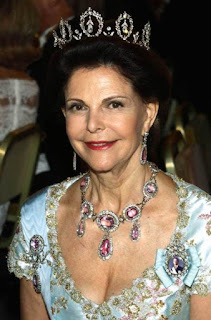 This was part of her wedding ensemble, and we talked it over back when she and Haakon celebrated their 10th wedding anniversary (linked above). 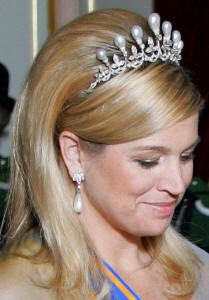 This one would fight with the Cambridge Lover's Knot Tiara for my favorite pearl drop tiara. This was one we reviewed in the run up to Monaco's royal wedding, click above for that. 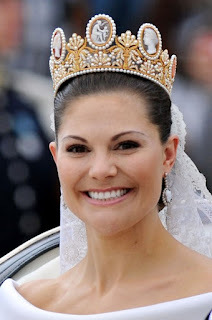 There were several tiaras on the list that I think would have ended up higher had we featured them in a Tiara Thursday piece prior to the Big Vote. I suspect this is one of them. 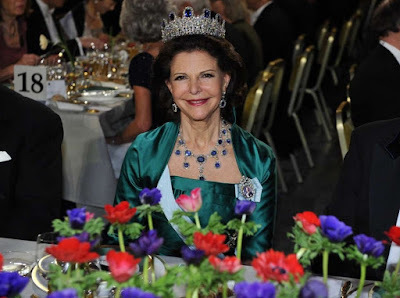 As it was, we handled this in advance of the Nobel festivities, click above. A perfectly pretty piece, and one of my favorites out of the Lux jewel vault. Click above to revisit its history. This is the grandest diadem in the jewel vault over there in Holland. 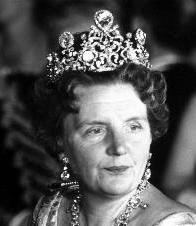 Queen Beatrix has never worn it (that's her late mother, Queen Juliana, above). If anyone's going to revive it, I feel confident it will be our magpie Máxima. We haven't discussed this one yet. The Girls of Great Britain and Ireland might be the Queen's most worn tiara, but this is certainly in the running for the most seen diadem; on stamps and such it's one of the official symbols of the monarchy. We haven't talked about all of the symbolism and history involved here yet. Okay, this one surprised me. 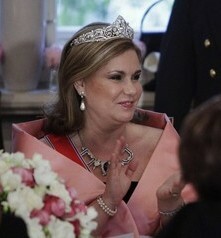 I'm not even sure I'd call this a tiara, and its one outing thus far was, well, not successful in my eyes. Perhaps you see great potential here? Anyway, we talked it through at the time of the wedding (click above). Another candidate for Best Whopper! We haven't discussed this one in depth yet, either. Methinks if De Kongelige Juveler had been released earlier in the year, this would have gotten a well-deserved bump. Certainly your requests for a piece on this baby have jumped! And it will indeed be coming soon to a blog near you. So, there you have it. 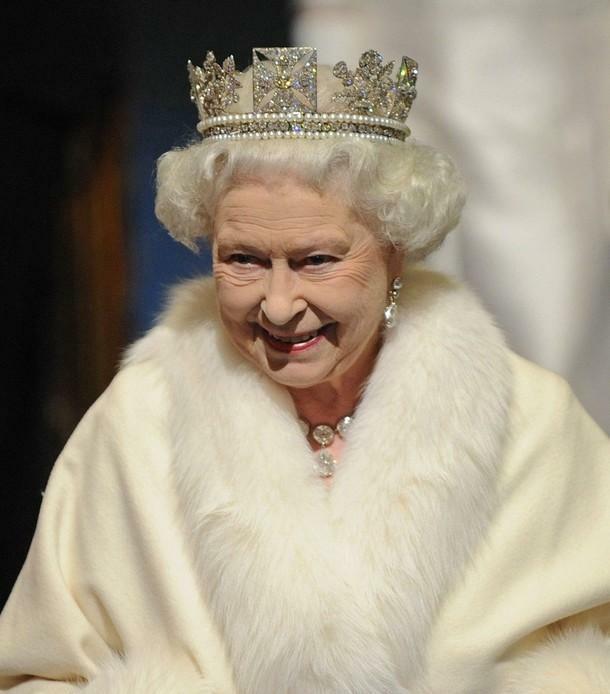 With so many tiaras proposed, once we got out of the Top 15, things were extremely close all around. Do these additions change any of your thoughts on the Top 15?